Well, here I go once again swimming against the masses with another hyped up and much talked about and loved title. Perhaps I should just stay away from the high fantasy reads since more often than not I tend to find myself fighting to stay engaged in the long drawn out stories but oh how I’d hate to miss out on those truly action packed gems that I do know exist out there. 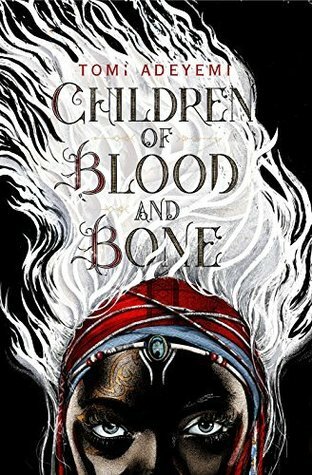 Children of Blood and Bone by Tomi Adeyemi is the first book of the young adult fantasy Legacy of Orïsha series. This book has gained most of it’s praise based off it’s diverse setting and characters and I will readily admit that is the best part of the book. Tomi Adeyemi has created her world within the pages based upon West African heritage and she did do a wonderful job setting that scene and incorporating it into the story. However, if I took the setting out of the equation when reading the story the rest of the plot when getting down to the meat and bones seemed to be pretty standard cookie cutter young adult fantasy to me. We have a ruthless King killing off everyone using magic to gain more control and power of his land. I have read that one many times before and probably will many times again. In this story Zelie is one that has magic and is in danger from the King, Amari is the King’s daughter and runs off with a scroll when she witnesses just how cruel her father can be and Inan is the Prince out to prove he deserves his father’s thrown and sets out to find his sister and kill Zelie. The point of view changes between the three which should have led to a faster pace following both sides but at over five hundred pages it just felt dragged out to me. Then with a cliffhanger ending to lead into the next book of the series when all was said and done the best I could say is despite the amazing set up it was just an OK start to the series for me. I’d be interested to see what you think of it. So many were glowing over it back when it came out but I just wasn’t wowed at all. I want to read this book for the longest time! I feel like at first there were only five stars reviews for it and all the hype, and it’s good to now, when some time passed, see some solid reviews for it too. I think this one was on hold for at least 6 months or more before it finally came in and I just didn’t get the “oohh and aww” feeling that I saw coming from the reviews. I finished and thought meh, it’s alright. Thanks for sharing your honest thoughts with us. I have hummed and hawed about this book for a while now and am still not sure. You have given me something to think about Carrie. Nice review. Thanks Carla! I really can see why people like the diversity/setting but the story just didn’t wow me, seemed to follow the same old tropes. That happens when we read so much. Definitely, I’m always asking myself if things were as obvious as they seemed or if it was just because I’ve read similar stories.